In the few months since parting ways with Mike Falgoust & Associates, Grey Hammett, Jr. has opened his own firm—Grey Hammett Commercial Real Estate—in a newly renovated office within the Industriplex subdivision. Hammett—along with former Sealy Falgoust coworkers Randy J. 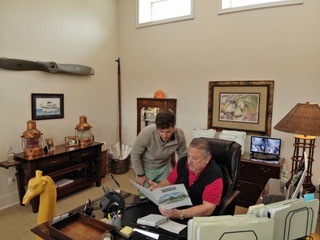 Herring and Scott Guidry, as well as longtime broker Mike Falgoust—opened Mike Falgoust & Associates back in mid-2010. But the brokers sold their Jefferson Highway office space last October to the Marionneaux Kantrow law firm for some $644,000, with plans to move down the street. At the same time, Guidry and Herring also purchased Hammett’s stock in the firm, where Guidry now serves as managing partner. He poured $200,000 into renovations on an office on Revenue Drive, off Exchequer Drive in a building formerly occupied by a pool company who was also a client. The space, completed around Christmas, includes a 2,000-square-foot front office and 2,000-square-foot warehouse that contains a cigar smoking room and “toy storage” unit. The location is a “perfect fit” for Hammett, who already boasts a large presence in the Industriplex area. Recently, he represented CMC Corporate Solutions as the company relocated its headquarters to a $1.5 million Exchequer Drive building. He also leased another Exchequer facility to Topgolf recruits.